Especially in large companies with many locations, it is sometimes a challenge to create and manage app content for different locations or specific target groups such as employees, trainees, or retirees. 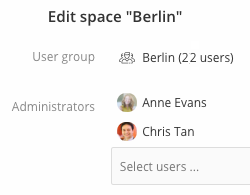 With Spaces, app administrators can now create a dedicated area (space) and appoint people to be responsible for it. Space administrators manage all the content in their space autonomously and in a decentralized way, but remain prohibited from accessing user data or global app settings. Spaces thus facilitates the overview in the admin interface and ensures the efficient creation of news, menus, events, or forms. Spaces is currently in beta status. If you would like to test it out, just contact your account manager. 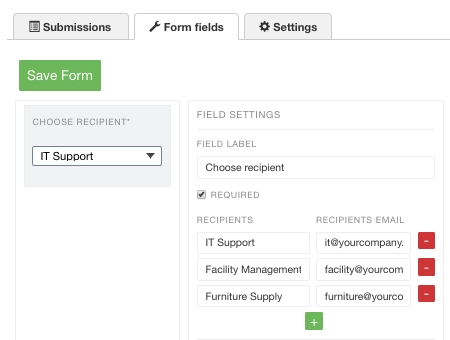 When you create a form, you can preset a list of potential recipients and add their contact emails. The user selects the appropriate recipient via a dropdown box in the form. The new function “Additional User Information” allows form submissions to include information about the sender. For example, the reader or recipient of the submission is now able to see the department or location of the employee submitting the form. For many processes, it is important that employees have access to their previous submissions or requests in the app. You can now activate this for each form as required. These intelligent forms are easier to complete and deliver far more accurate results, helping you to further digitalize your HR processes, production steps, and other internal processes with your employee app. Previously, if only some of your employees had access to SSO login (single sign-on), you had to decide between two options for onboarding: either you used SSO for your employee app and did not reach all of your employees, or you did not use SSO and risked lower adoption rates among those colleagues that expected the convenience of SSO. From now on, the employee app fits seamlessly into your IT infrastructure by combining SSO login with all available login methods. Employees with SSO can log on to the app as usual, and all other colleagues can obtain access to the app via a username or an email address. This login combination is also useful for inviting candidates, working students, retirees, or business partners to the app. You are therefore able to bring target groups into the app that are maintained in different source systems. Please contact us if you are interested in combining SSO login with other login methods. Staffbase invites you to actively shape the future of your employee app with our new Idea Portal, a platform for sharing ideas and wishes. Your feedback will provide value to the entire Staffbase community and make the development of new app features more transparent. You can even upvote the suggestions of others, helping to generate new use cases. The Staffbase product team is informed of new suggestions and maintains the Idea Portal so that you get insights into planned features and trendy topics. The Idea Portal can be accessed as an Admin, Space Admin, and Managing Editor via the Admin Interface > Dropdown menu on the top right > Idea Portal. The Staffbase Download Page is a new way to distribute your app outside the public app stores. Contact us if you are interested. It is now possible to select user groups as participants for group chat conversations. This works with internal and open groups. Users will see group chat conversations based on their user group memberships. You can now mute individual and group conversations to not receive any notifications or unread badges. The conversations will still be available through the inbox and you can actively use them while muted. Videos can now be uploaded to news posts and pages from within the app. 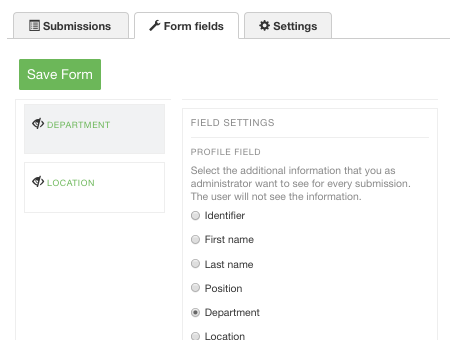 Forms: The new field "Date" allows the selection of a date value within a form. Calendar: It is now possible to label an event with a color. Advent Calendar: You can now export the full ranking of all participants. The change was rolled out in late 2017 already. 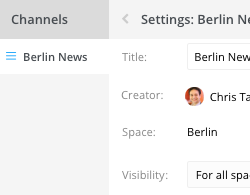 It is now possible to select multiple news posts to copy, publish, unpublish, and delete them in bulk. The native app has improved support for the iPhone X layout now. “Private Messaging” has been renamed to “Chat”. Widgets inserted on a start pages are now visually shown in the text editor and can be edited more easily. On iOS devices the in-app browser has received several improvements: its header always uses the colors of your app, the close button is localized properly, and the toolbar got a fresh look. The full screen photo view will now hide the iOS status bar for a more immersive experience. The app now sends less non-critical information to device’s log. Before users log in, the app now correctly shows public content based on the device language. The file upload size has been increased from 10MB to 25MB. Videos and attachments can even be larger than 25MB. Advent Calendar: It is now possible to use answers longer than 50 characters. The change was rolled out in late 2017 already. 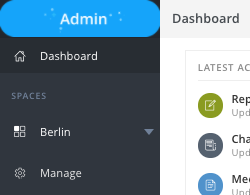 The menu for personal settings on the top right in the Admin Interface contains useful links now, for example to the support portal and the Staffbase blog. 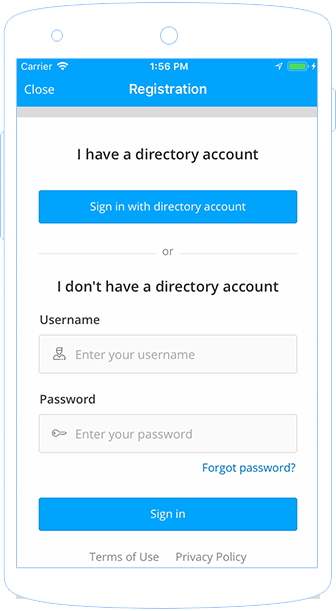 The user management now also contains the subcategories for the SSO login, email self-signup and the user synchronization. So all the user management tasks are aggregated in one place. The lists of registered, deactivated and pending users now contain all the important information, for example the identifier and the email address. 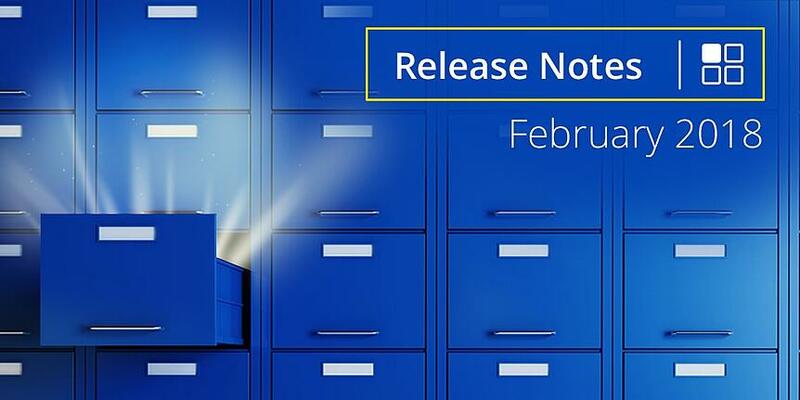 The entries in the user changelog were improved in several languages for easier understanding. Actions of API tokens are now properly shown in the user changelog as well. Printed invitations now work when onboarding users with a username and a password as well and contain QR codes for an even easier signup experience. When creating longer chat messages the text area properly scrolls now. On some Android 7 and 8 devices the video upload from the device’s gallery failed. This now works across all supported Android versions. Uploading large videos in the chat could cause the app to crash. This is fixed now. The web app now always loads correctly in Chrome browser on Android 8 devices. When playing videos in the web app with Firefox browser version 57 the video toolbar is now available again. When switching between different content in the app the unread badges unintentionally disappeared and then reappeared. The unread badges are always visible now until the user saw the content. In rare cases, quickly switching between chat conversations could cause chat messages to be shown in the wrong view. This has been fixed. Chat conversations are sorted correctly now and are always shown in the inbox. Email notification settings were unintentionally not shown for users that login with username and password. This is fixed now and all users can see their notification settings. Images that were resized to fit into a news post now open in their original proportions when you click on them for the full-screen view. When editing in the mobile content editor videos are now handled correctly. Previously, it could happen that an existing video got broken or unexpectedly duplicated. The link to the support portal in the general Staffbase app works again. Maps: On iOS devices, clicking on the links “Open in Maps” and “Navigate in Maps” will now correctly lead the user to the Apple Maps app. That was broken previously. Meal Plan: Viewing the details of a meal in the meal plan now works again on iOS 11 devices. Previously, a blank page was shown in some cases. 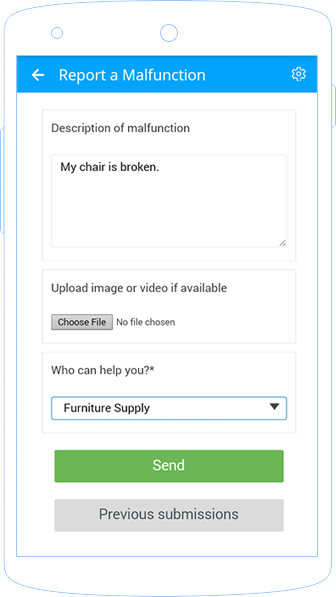 File upload in forms now works correctly, even when the form also contains text lines and more fields like a second file upload or multiple choice questions. Submitting a form from an iOS device led to duplicate submissions. This is fixed now. Form fields with a dropdown selection are styled correctly in Internet Explorer browser now. Event names are rendered properly now and use the available space. Long event names are cut off if no more space is available. Previously event names were cut off even if there was more space available. The event registration works correctly now. Previously there was a bug that did not allow users to register for an event with only one spot left. The ranking now gets updated on the next day when the results can be seen. Previously the ranking changed directly after answering, which was not correct. The sorting of the participants works correctly now by ranking points and alphabetical order. Renaming a user in December, while the Christmas Calendar is running, works properly now. Previously this led to multiple entries of that user in the ranking. The CSV export now handles all special characters. Managing Editors were incorrectly able to edit all user groups when having admin access to at least one. This is now back to only being able to see all user groups. Editing a user and the associated user groups at the same time works now. Very long user names are rendered properly now and will be wrapped to a new line if too long. When the Firefox browser was updated to version 57, several changes were introduced that interfered with Print on Demand. This feature now works correctly with Firefox browser version 57. When managing hundreds of news channels in Chrome browser the rendering now works properly and shows all news channels. When using the search bar of the web app in Internet Explorer browser there are no rendering issues anymore. When editing the menu in Internet Explorer browser the menu editor is styled correctly now. Fixed a styling issue with the toolbar buttons in the text editor when using large texts in Internet Explorer browser and Edge browser. Scheduling of news posts now also works properly in Internet Explorer browser and Edge browser. In the Internet Explorer 11 browser, scheduling a news post in a rare time format works fine now. In the Internet Explorer 11 browser, when uploading an image to a news post the placeholder image was visible next to the image itself even after the upload. Now, the placeholder is removed as soon as the image is uploaded. 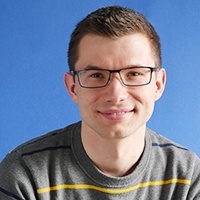 When you created a new translation of existing content, the translation was not always saved. It is saved now. Invite dates of users are shown correctly in the dashboard of the admin interface and in the CSV export of the user database now, even if users are currently in the process of signing up. The formatting of tables in notification emails works again. There was a bug that could lead to weekly analytics reports not including Sunday. Now the reports correctly include Sunday. If you have any questions, please do not hesitate to contact us or leave a comment below.